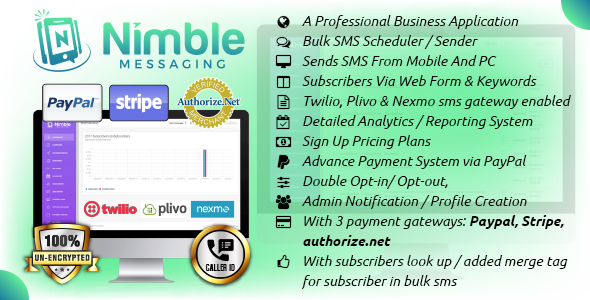 It’s our immense pleasure to introduce our nimble messaging web application android version for our clients and customers..Now you can all enjoy our new * Nimble Messaging Business Mobile SMS Marketing Application For Android at your mobile phones * With many powerful features inside..
13- Bulk sms feature has been updated for fast sms sending. 14- Please find new cron job url under settings tab. 15- Twilio, plivo and nexmo are integrated with new features.